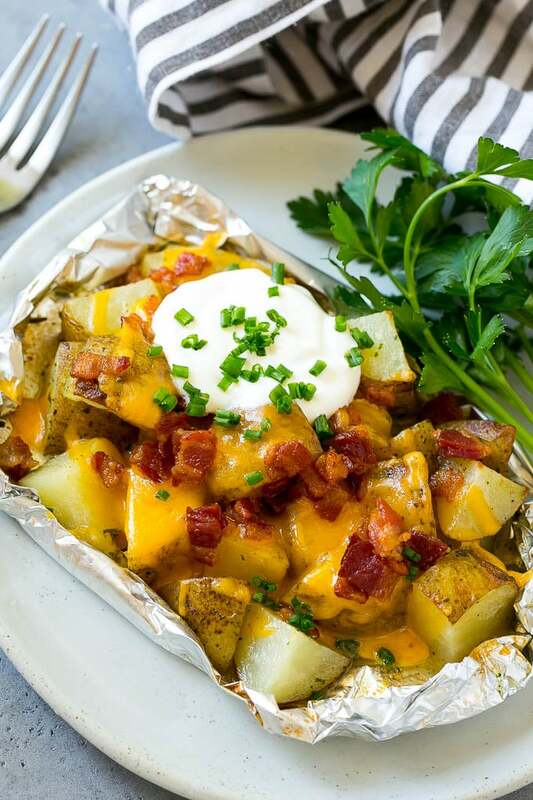 These grilled potatoes in foil are diced potatoes cooked in ranch butter, then topped with melted cheese, bacon, sour cream and chives. 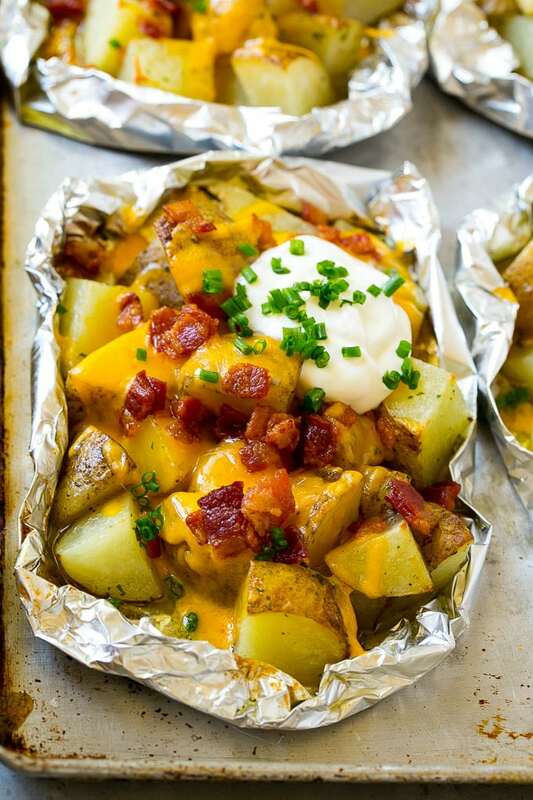 All the flavors of a loaded baked potato in foil packet form! Foil packet recipes are easy to make with minimal cleanup required. 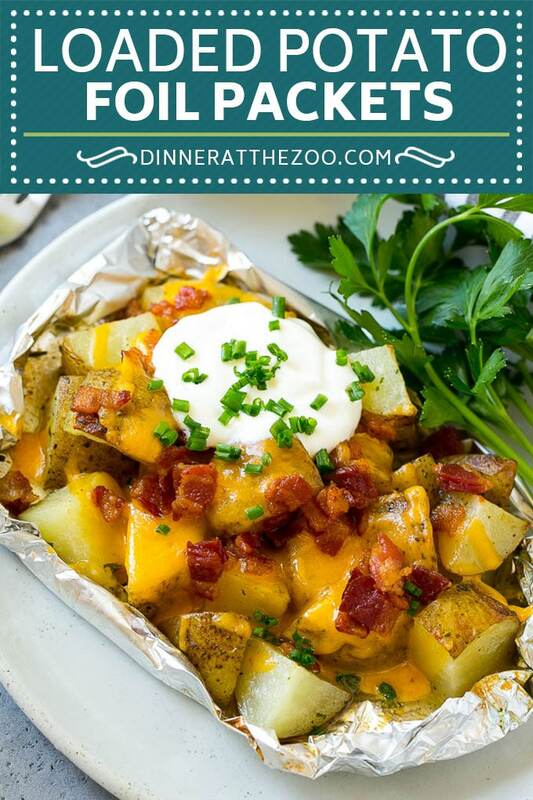 These potato foil packets are my go-to summer grilling recipe, because let’s face it, you can never go wrong with bacon! Do you ever have those recipes you love to eat year round? 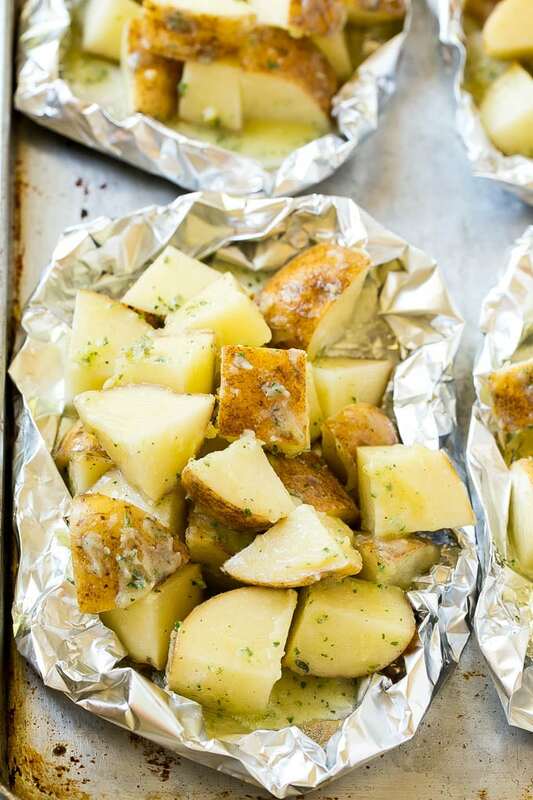 Grilled potatoes in foil is one of mine and they’re so easy that I end up making them quite often. The family doesn’t mind because it’s one of their favorite meals as well, especially because you can toss chicken or steak in with them to add some more protein. HOW DO YOU MAKE GRILLED POTATOES IN FOIL? These potato foil packets are large chunks of potato smothered in ranch butter and cooked to perfection. 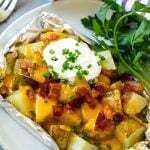 They’re topped with melted cheese, bacon, sour cream, and chives for the perfect side dish or main course. It’s like eating a baked potato, only better! Although any potatoes will work just fine for these potato foil packets, I suggest using russet potatoes. They’re inexpensive, readily available and really give these grilled potatoes a baked potato taste. However, if you don’t have russet potatoes on hand, there’s no need to fret because other potato varieties will still leave you with a delicious recipe! There are a couple of ways you can cook your grilled potatoes in foil. Don’t let the name deceive you. These definitely can be made on the grill, but if you’re unable to grill or don’t feel like it, they can also be made in the oven without sacrificing any flavor. Instructions are provided for both routes of cooking in the recipe card below. After the ranch butter soaked potatoes are cooked until tender, they get topped with a generous amount of shredded cheese and bacon. The potatoes go back into the oven or grill for just a few minutes until the cheese is melted. Some people don’t know that potatoes, eaten in the right portions, are actually great for your health. They contain large amounts of fiber and are low on cholesterol. Due to this, they help lower the risk of heart disease. Not to mention, they contain many other vitamins and minerals that your body needs on a daily basis. I have to say, there are few things more satisfying than a good potato dish. I love these grilled potatoes because they’re hearty, easy to make and cleanup is minimal. We will be making these foil packets quite a few more times this summer. 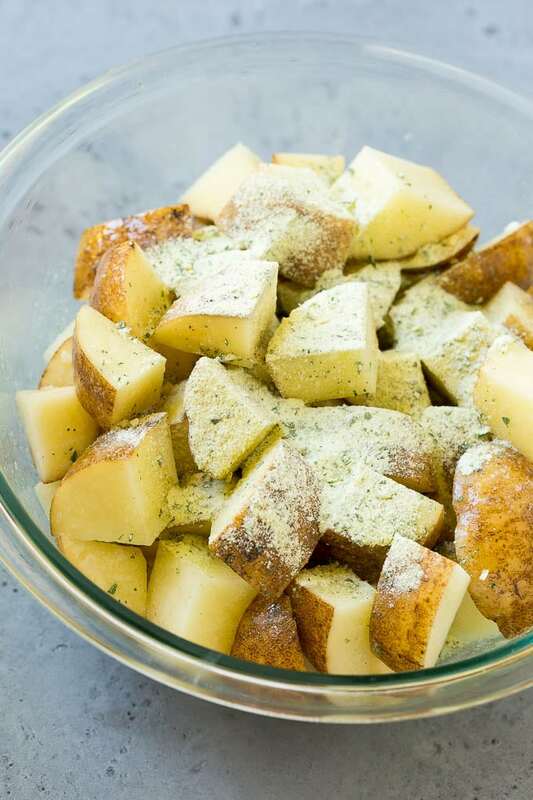 Preheat a grill to medium heat or an oven to 400 degrees F.
Place the potatoes in a large bowl along with the butter and ranch seasoning. Toss to coat. Divide the potatoes evenly among the foil squares. Fold up the foil to seal the packets. Bake or grill for 25-30 minutes or until potatoes are tender. 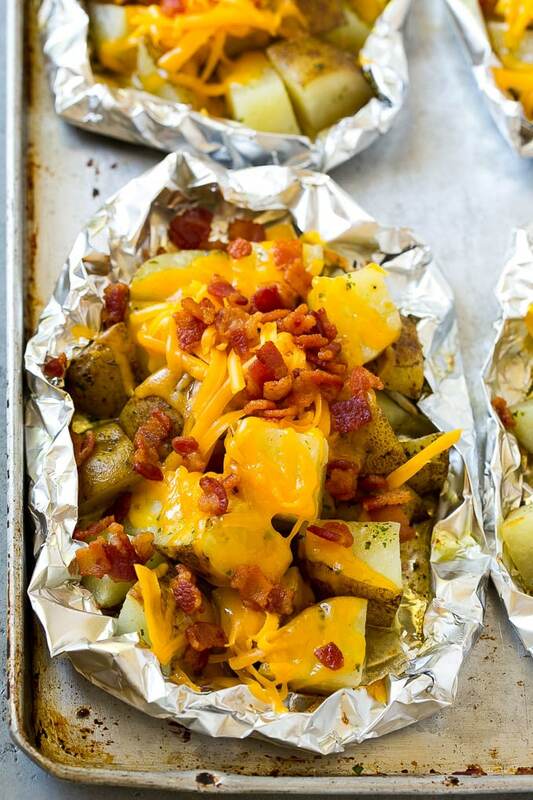 Open the foil packets and add the cheese and bacon. Leave the packets open and return to the oven or grill. Cook for 3-5 minutes or until cheese is melted. Top each packet with a tablespoon of sour cream and sprinkling of chives, then serve immediately. We love this potatoes and I also top them with fresh salsa! These look so delicious! Can’t wait to surprise my husband with these! This looks AMAZING!! and so easy to make!! I will have to make this for my boys next week! I love the bacon in the grilled potatoes but I have never tried making them. Thanks for sharing this recipe and I would like to try it out. This is making me so hungry right now! I can just imagine how delicious they taste! Oh my goodness this looks freaking delicious!!!! I am so starving now! I can’t wait to make this super yummy recipe! Oh geez these look amazing! I want them for my lunch now! I would love to make these for my BF as he loved cheesy chips and this is a step up for sure! OMG!!! This looks so freakin good. I’m making this tomorrow. No joke. This is going to be made. Thank you for sharing!! I need to try to make this for my kids since they love potatoes!